It is extremely difficult to define art in entirety. Highly appreciated, in galleries, traversing through paintings, murals and sculptures and parallel unexplored, found in hundreds of nooks and crannies of the ever so vibrant India. Art is created everyday by hundreds of artisans, unknown and unheard of. 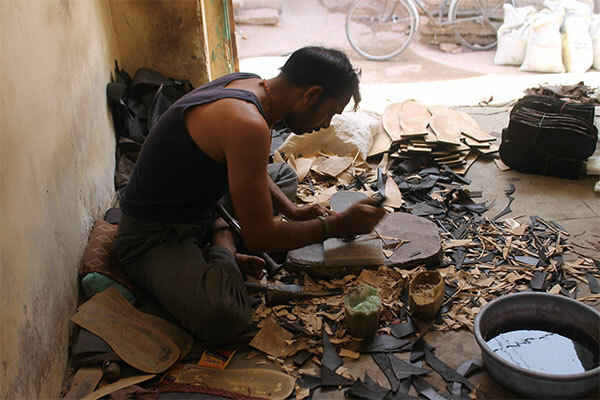 In one of our documentation trips, Project Kalayatra navigated through Jodhpur’s Sardar Market to discover a community of artists, creating one of India’s favourite footwear. The history of footwear in India can be traced back to the Vedic period. To put it in easy terms, Indians have been wearing shoes and sandals, forever. In the midst of the evolution to international brands and unconventional designs, there have been things closer home, which still find abundant space in our hearts and wardrobes, alike. Jodhpuri chappals, enclosed in multiple hues is the protagonist today. A walk through the ‘Chappalon Wali Gali’ behind the Clock Tower, leads to a narrow nondescript lane. Awaiting no second glances, the lane looks like any of the hundreds winding around Jodhpur, famous for the 15th century Mehrangarh Fort. Chappalon wali gali is literally translated to the Footwear Street, lined on both sides are a dozen houses, rhythmically constructing their version of art in the form of Jodhpuri chappals. The story of a Jodhpuri chappal is as romantic as they get, the metamorphosis of plain leather into a completed colourful chappal is incredibly, disciplined as much as it’s beautiful. 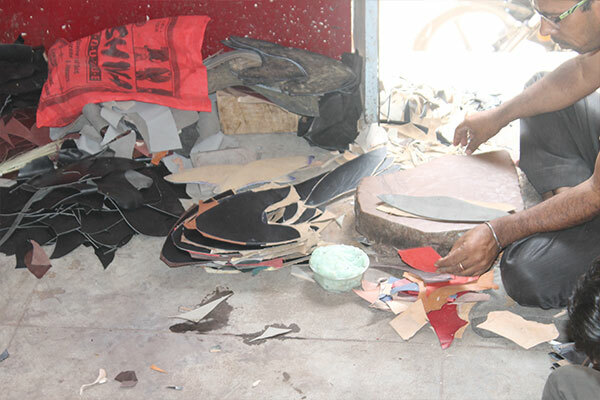 The process of making the chappal is an example of a well-oiled factory line, where the women and men share equal responsibilities to bring out the finished product. 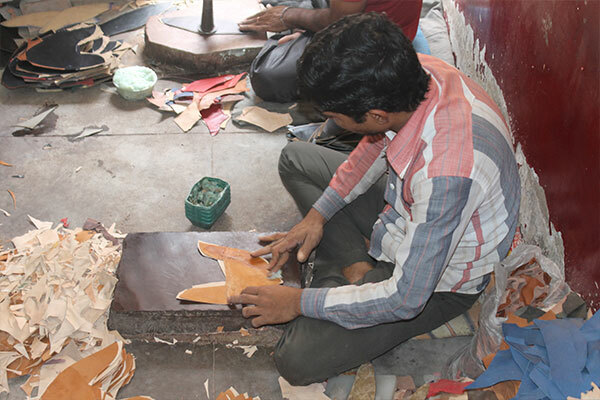 The leather received from various parts of the state is treated and then worked on by the men who learn the art from their fathers and have been doing so for generations. The soles and covers are turned into sturdy shapes to fit various kind of feet and sizes. Now, the women take over with their nimble fingers, creating the beautiful embroidery which makes the Jodhpuri chappal so distinct from the various footwear coming out of other parts of India. 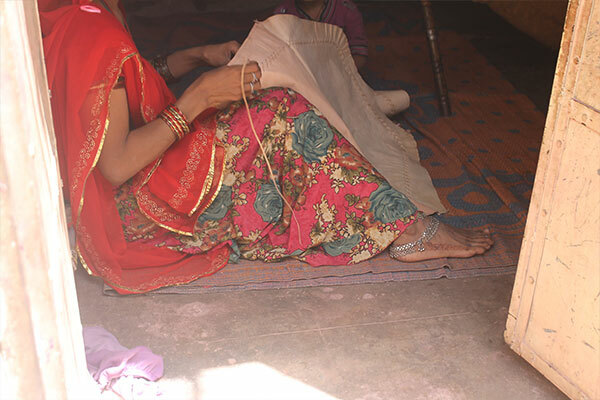 Cooing to the infant on her lap, sought by the whistle of the pressure cooker every five minutes, this artist from under her ghungat (veil), embroiders three to four pairs of chappals, every day. Jodhpuri chappals have adorned feet for years, picked from these streets they are usually sent in huge numbers to shops in bigger cities, especially to the metros. They are supplied to the hawker at the pavement and dozens of e-commerce websites, alike. The cost of a Jodhpuri chappal ranges from Rs.300-500 when bought from any of these sellers. The artist usually are paid as low as Rs.30 to embroider one pair of the Jodhpuris. For years, they have worked under clouds of economic disparity and it’s not unknown to them. Quite contrary to the morose atmosphere that is expected, these artisans overwhelmingly display happiness, punctuating their everyday juggling of work. There is an infectious camaraderie of sharing a common goal to create a craft. What sets this community apart, is their pride in accepting themselves as heirs to a skill, passed on to them since generations. The younger artists have migrated to cities as is the story to do with many art forms in small cities and villages, yet many have returned to their community in the recent times. Unknown to many, more often than not, economic support plays second fiddle to the appreciation and encouragement that the artist seeks. In the last few years, few resident history guides have brought sets of tourists and visitors to the chappalon wali gali, the difference is evident in the faces of these artists. No prominent support for financial independence has been initiated by any individual, organization or the government. The artists themselves, seek no aid and are vocal about the fact that all they need is a chance at fair trade. A little effort can go a long way, may it be the tourist, the visitor, the volunteer or the shopper, one can script a significant role in this movement. Jodhpur is visited by tourists, all year round. 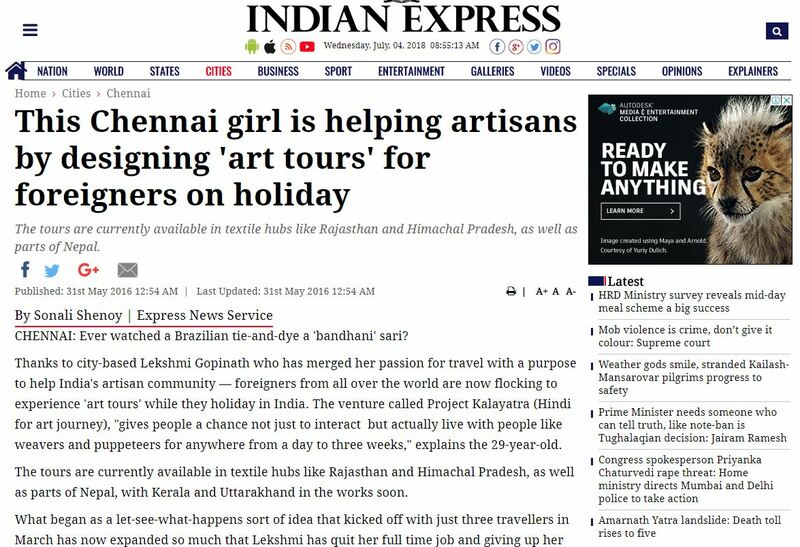 Inculcating these artists and other existing art forms as a part of the tourist trail can be amply beneficial. A visitor to Jodhpur can contribute by taking half a day out of the schedule, to spend time with the artists, chappalon wali gali is central to Jodhpur and easily accessible. Volunteering to help or learn the trade and buying directly from the artisans or organizations who support fair trade for the artists is another positive. It is heartening to see the comeback of Indian indigenous Art in the lives of the Indian shopping enthusiasts. Indian is a kaleidoscope of handicrafts, exploring, learning and being aware of this is the first big step to indigenous art conservation. As much as the city of Jodhpur owes its glory to history, it also does to the various art forms which have originated and strived here. It is about the Jodhpuri chappals, the Bandhini sarees, leather bags, camel bone sculpting and so much more. All it needs is an effort to explore and discover that little extra which is usually unheard of. This vibrant city welcomes explorers, connoisseurs, artists, story tellers and wanderers, to experience Art which not easily found in books. 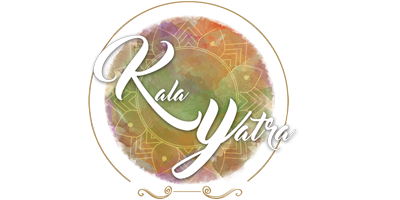 Kalayatra is a democratic movement for ‘art conservation’ which involves everyone, from young students to travelers to corporate organizations in an endeavor to document, appreciate and understand indigenous Indian art and artisan community.